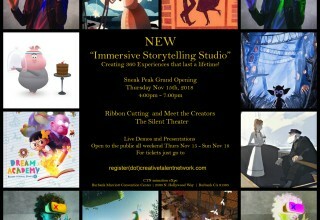 BURBANK, Calif., November 6, 2018	(Newswire.com) - The Creative Talent Network (CTN) is the premier network of the top talent artists, studios and suppliers in the animation, visual efx and video game industries whose contributions and support can be seen in some of the highest-grossing films in the history of animation. Recognized by the State of California for their special event contributions and achievements, their annual expo event The CTN animation eXpo (CTNX), now in its 10th year, provides jobs, tools and services to this highly targeted group both locally and internationally. Now with a base of more than 180,000 artists, many being current members of the Academy of Motion Picture Arts and Sciences and Academy Awards Winners™, Golden Globes Winners™ and Annie Award Winners, CTN stands tall on the landscape, working with top production studios like Walt Disney Animation, Nickelodeon, Sony Pictures Animation and Dreamworks Animation along with other highly targeted and specialized industry suppliers from around the world. 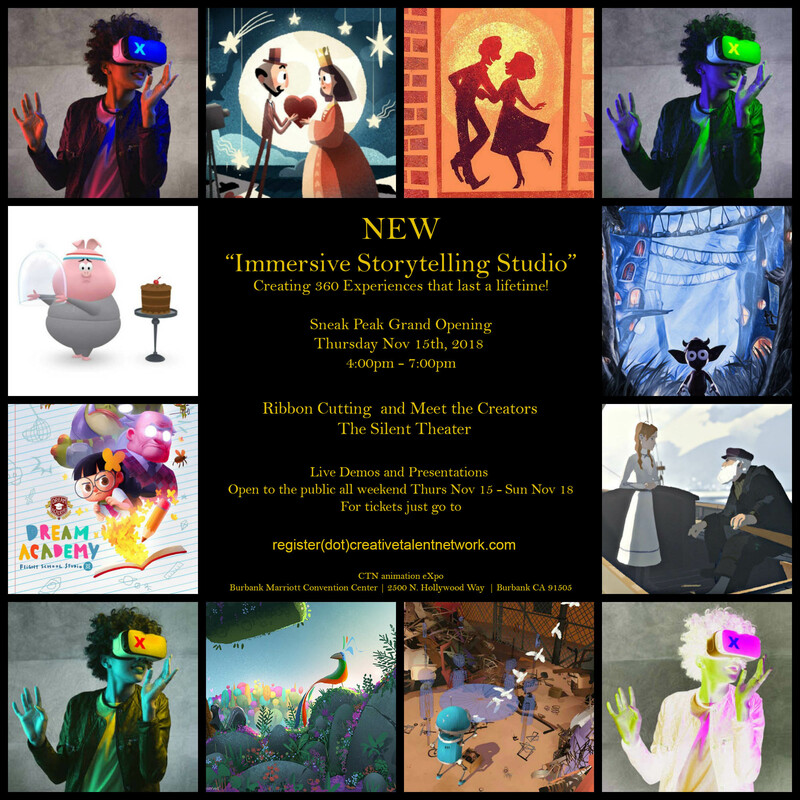 By putting "The Talent Center Stage,” CTN brings them all together once a year in a city called Burbank that officially proclaims "Animation Week" just for this event. What will you create when the possibilities are endless? 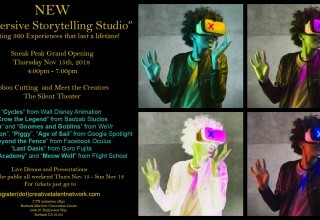 The theme this year, “Creating Experiences That Last a Lifetime,” will manifest itself by launching the world premiere of the “Immersive Storytelling Studio,” a 10,000-square-foot virtual reality space with over 20 pods of storytelling that includes the West Coast Premiere of Walt Disney Animation Studios' first VR film “Cycles" and the world premiere of “Dream Academy," a collaboration between Flight School and Starbreeze. Other films include “Crow the Legend” from Baobab and the launch of Facebook Oculus' new wireless goggle headset taking visitors "into a Quillustration” and special offerings from Google Spotlight, Mindshow, Tvori and WeVr. 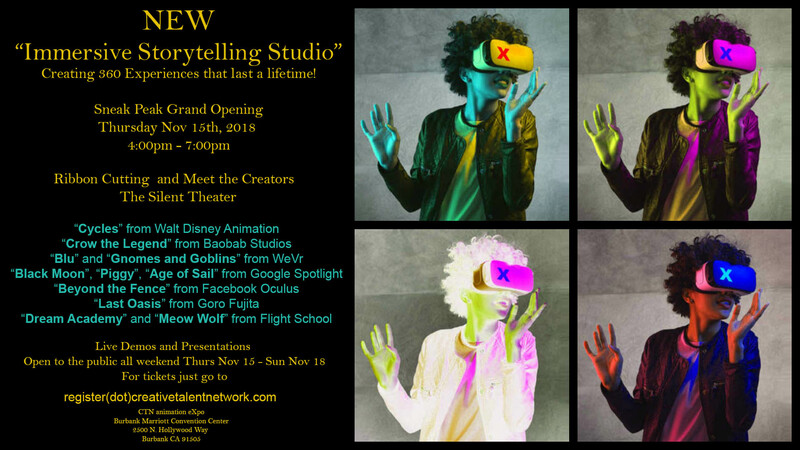 Co-produced by Creator/Producer Jake Rowell from WeVr and Tina Price from CTN, anyone interested can just sign up, show up and let's see what they create when the possibilities are endless. 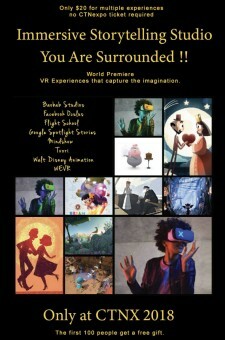 The “Immersive Storytelling Studio” - You are surrounded!! Friday/Saturday, Nov. 16-17, 10 a.m.-10 p.m.
Sunday, Nov. 18, 10 a.m.-5 p.m. The first 100 people to "experience" this new space get a free gift. CTN and Tina Price are always looking towards the future. Tina Price’s curiosity for technology led her with a small team to pioneer 3D computer animation in every Disney film from “Oliver and Company” to “Fantasia 2000.” Calling themselves the "Late Night Crew," this hot group of talent created the first processes and techniques that led to the development and implementation of 3D animation and Disney’s proprietary Ink and Paint Computer Animation Production System (CAPS). Working both traditionally and digitally, Tina spent most of her career contributing to every feature animated film at Disney, including the award-winning short film shown at SIGGRAPH “Oilspot and Lipstick,” and became the first woman to be titled as “Head of Computer Animation” at Walt Disney. She was also honored by the Association of Motion Picture Arts and Sciences as a "Pioneering Woman in Animation." 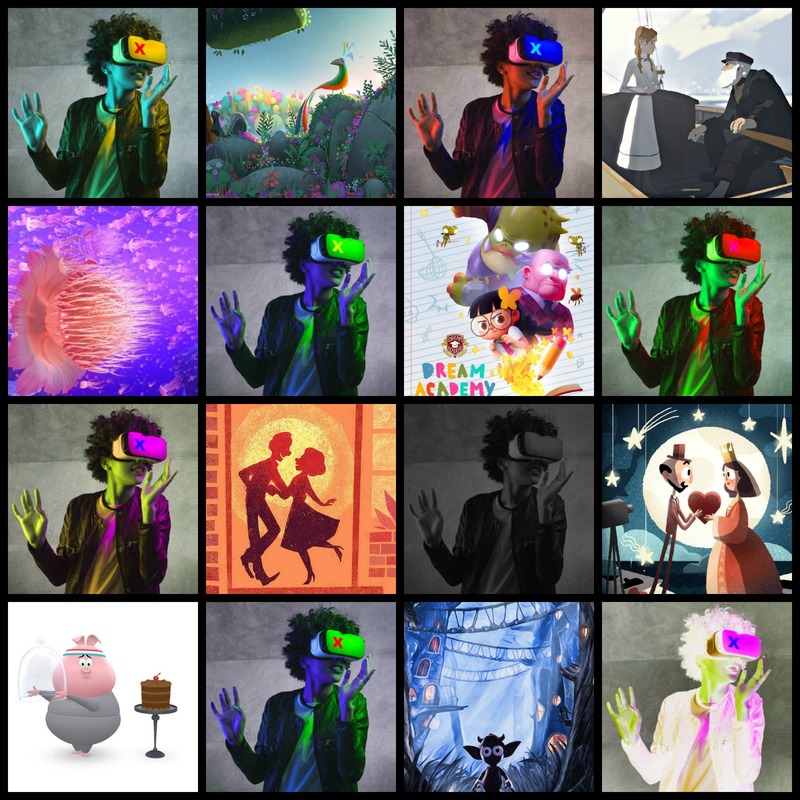 She has filled both creative and technical roles in the animation television and film industry for over 25 years. Her work is published in "The Art of Aladdin," "The Art of Dinosaur" and she has spoken about Computer Animation techniques on panels at SIGGRAPH, Annecy and Imagina, as well as being interviewed in Computer Graphics World and The National Geographic on the subject of computer animation in 2D animated films. Her versatile skill set and insatiable curiosity led her to devote herself full-time to her own company The Creative Talent Network Inc. (CTN). 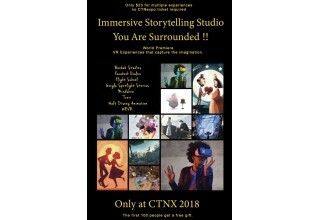 Since its inception in 2006, CTN has become the international community standard for top talent artists in the animation industry and host to the award-winning annual trade show event, The CTN animation eXpo. 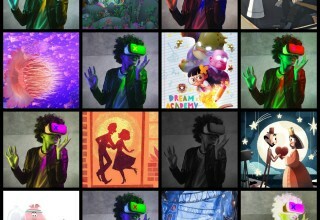 She is now looking to the future and CTN-XR Conference and Expo is the next big event for the VR and AR communities brought to the public by the minds behind CTN.